A student at The University of Western Australia has won Convocation's highest honour for her outstanding volunteering work at UWA and around Perth. Jiwei Li, who completed a Bachelor of Science degree majoring in anatomy and human biology in June this year, has done volunteering at Perth Children Hospital, St John Ambulance, the Swan Estuary Reserve Action Group, Unimentor at UWA, MicroVolunteering, the Leukaemia Foundation, and UWA's Save the Children book sale. 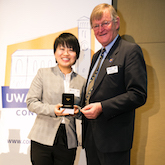 Warden of Convocation, Dr Doug McGhie, presented Jiwei with her Convocation Medal at the recent Spring Ordinary Meeting. "In 2017, Convocation joined with the UWA Student Guild to annually recognise an outstanding volunteer from UWA with the award of a Convocation Medal, and I am delighted that this year it goes to someone whose volunteering has been exceptional and a real inspiration to other students," Dr McGhie said. "Jiwei Li's volunteer work is really impressive, from playing with children who are ill at Perth Children's Hospital, to being an event and health officer at St John Ambulance, to recruiting and leading up 20 UWA student volunteers at Pelican Point on Matilda Bay on the first Saturday of every month to work on the Swan Estuary Reserve Action Group." Jiwei said her desire to do volunteer work stems from her high school days when a teacher voluntarily tutored her – who then became a close friend – and she felt this opened up a whole new world for her. "I enjoy volunteering and, while I know some people just think it's just volunteering and you don't get paid for your work, it's far more than that," Jiwei said. "It's the smiles on those kids' faces, the hope that knowing those migratory birds will have a place to settle, so they don't become extinct – it's the faith, love and humanity we can see through volunteering". Jiwei said volunteering is a valuable and meaningful journey which lets us grow better as a person, and at the same time, allows us to meet like-minded people. "All these volunteering opportunities have enriched my learning processes and has allowed me to take on new challenges and responsibilities," she said. "I hope that my passion for volunteering, allows me to contribute to creating a better future for people and the local environment."